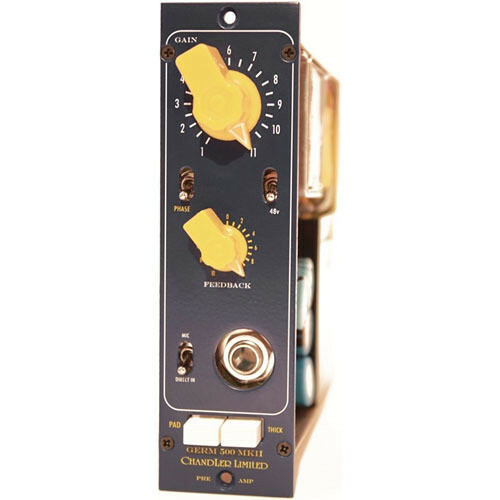 The Chandler Limited Germ 500 MKII Pre Amp is a one-unit pre amplifier designed to be mounted in an API 500 Series-style lunchbox. The device's components were re-designed from the original rack version to work with API's lower-voltage power standards and connectivity requirements. The pre amp features Germanium transistors in Class-A transformer-balanced circuits. The sonic benefits of Germanium transistors are that they exhibit the firm tonality of a solid-state circuit combined with the warm and smooth harmonic distortion characteristics of a tube. The XLR microphone input, signal output, and power connections for this device are built into the lunchbox rack enclosure that the module plugs into. For direct input, the pre amp also includes a switchable 1/4" TRS instrument connection on the front panel. Box Dimensions (LxWxH) 10.5 x 8.7 x 5.3"